Jimmy and Steven again in Frankenmuth. 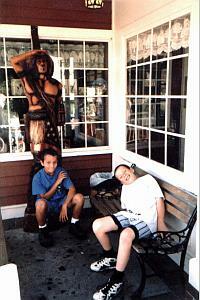 We used to go to Frankenmuth every summer, Jimmy and I. I remember one summer driving back, it was very hot. The temperature was in the 90s. My friend Artie was with us, a great lady who I worked with at the time. My car had no air conditioning, so I had the windows rolled all the way down and I also had a spray bottle full of water that I spritzed my face with for relief. Halfway home, we all stopped for cold drinks. Jimmy got orange juice. Back in the car (and unbeknownst to me), Jimmy poured some of his juice into my spray bottle. Needless to say, the next spritz on my face didn't have the desired effect. Jimmy and Artie got a big laugh out of it. Me, I wasn't quite so happy!